This story originally appeared in the Spring 2019 issue of Domino, titled “Clutch Move.” Subscribe to be the first to receive each issue! You know when you wake up and wear all your favorite things in your closet—and somehow the outfit just works? That’s Brett Heyman’s Manhattan apartment. 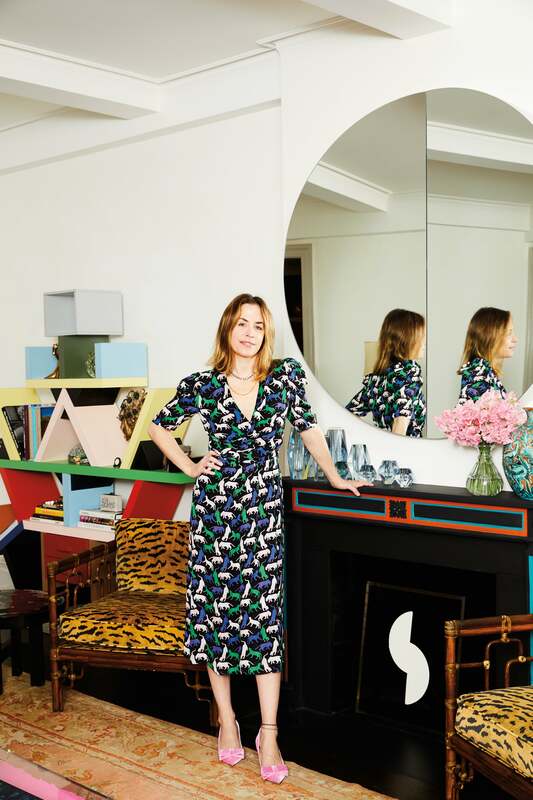 The founder and designer of Edie Parker, a collection of deliciously fun clutches and accessories, says, “It’s a hodgepodge.” The Upper East Side home, which Heyman shares with her husband, Gregory, and their three young children, is a fresh Technicolor enclave in a classic prewar building. A series of 10 Andy Warhol Flowers prints welcomes you in, lining the walls from the open foyer into the aubergine lacquered library, reading almost like wallpaper rather than wall accent. Then there’s the living room, centered around a hot pink pigment–filled Yves Klein coffee table; a dining room covered in a ROYGBIV of multi-era art; bathrooms done in robin’s-egg blue; and children’s rooms with inspiration walls full of stickers. Even Heyman’s bedroom mirrors have color, with a purplish wash effect, concealing a swoon-worthy collection of shoes within. A black and ivory powder room looks relatively straightforward, but then—oh, wait—there’s a magenta-painted coat closet around the corner to restore balance. Walking from one room to the next would make the most reserved of visitors gasp. And it’s not because of the grandeur, though there’s plenty of it to go around. It’s that every glance is a revelation of sorts. “I like an explosion of color and textures,” Heyman says. “Your eye is moving and something looks interesting and different every time.” Indeed, there is a delightful, playful—almost subversive—mix of disparate styles: a vintage knickknack atop a 1970s green malachite Ado Chale table, a contemporary sculpture with an antique dish, pieces from 1stdibs and flea markets, neons with pastels, polished with campy. And yet nothing looks out of place. And an all-important dose of humor. This super-designed home is backed by Heyman’s lovingly laissez-faire mentality, served with a side of irreverence. That is perhaps why, counterintuitively, the space works so harmoniously. Filling an Ettore Sottsass shelf with her children’s drawings, old Edie Parker designs, and a “ridiculous” nonworking, metal-and-bead peacock lamp isn’t just interesting—it’s fun. As she looks toward the curious framed cat collage hanging above a chrome Paul Evans bar, Heyman lights up. “In my mind, there is some fabulous folksy woman who spent months and months making that cat,” she explains. “I happened upon it at a Connecticut flea market like it was a treasure, made it the focal piece, and love it.” Each vignette you come upon in the apartment is like a firm handshake, then a wink. That idea is mirrored in Heyman’s work, too. Originally inspired by mid-century design, the Edie Parker collection translates acrylic, a once-humble material, into glossy, handcrafted accessories—from clutches and mini totes to board games and coasters. But the beautiful craftsmanship doesn’t get in the way of a good time—it enhances it. Bag names like Double Shot and hues including honeydew, poppy, and rainbow confetti infuse the line with a sense of levity, as do graphic floral and heart motifs, the latter of which Heyman hand-sketches herself with crayons and colored pencils. Her designs featuring cheeky sayings and custom names have been a hit since Edie Parker’s 2010 launch, well before meme-like messaging was mainstream. Some of the early clutches had two-sided quips in bold lettering: Yes/No or Good/Bad, as well as a surprise favorite, Divorced, letting your purse sum it up for you. “It felt like telling the world who you were, in a way that people needed to listen,” Heyman says. And while those signatures are still part of the collection, she’s evolving into using materials such as wicker and wood, too, expanding into tableware and bar accessories, and employing new ways of adding a hint of elevated smirk.